You can read everything on the Moodle learning website on your smartphone and on your iPad and other kinds of readers, such as Kindle and Google Tablet. Moodle has apps for both Apple and Android devices (see download.moodle.org/mobile/ or visit your App Store). Many of the readings for the course are posted as PDF files, which can be easily downloaded to your device. But did you know that the Wilmette Institute has now implemented mobile registration by credit card? Before you read how to do that, take a moment to read five important things you need to know. 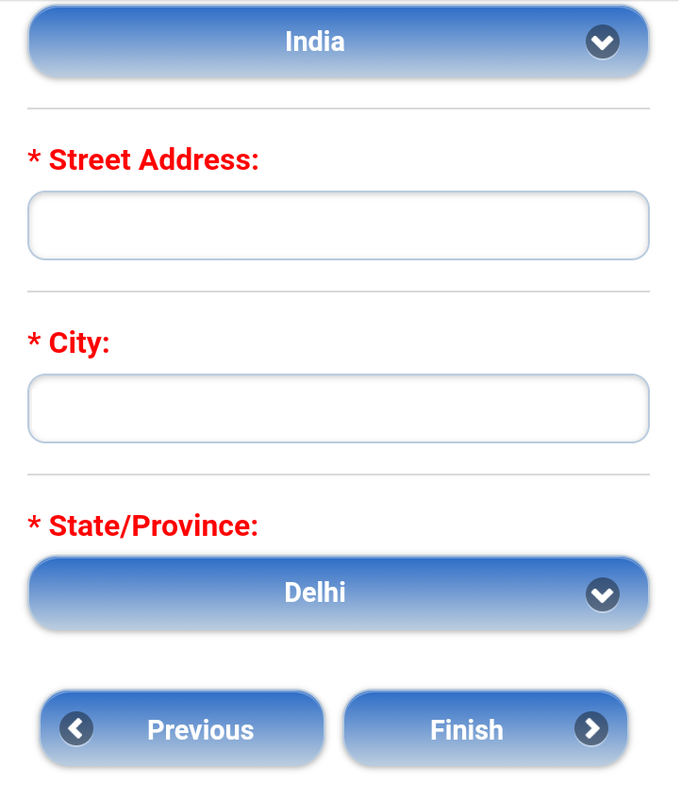 There is no special link from which to register on your mobile device. 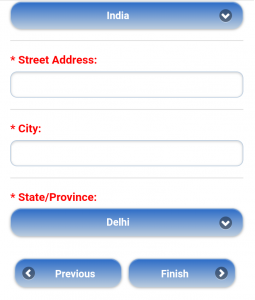 As long as your browser is up to date, it will redirect you to the mobile version of the registration page. 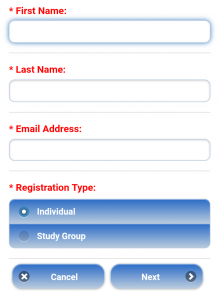 Study-group registration is not currently supported on mobile devices. You will need to use a desktop computer to register a study group. Mobile registration is safe, and credit-card payments are secure. 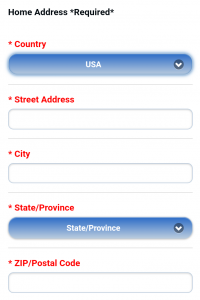 The address fields have been expanded. 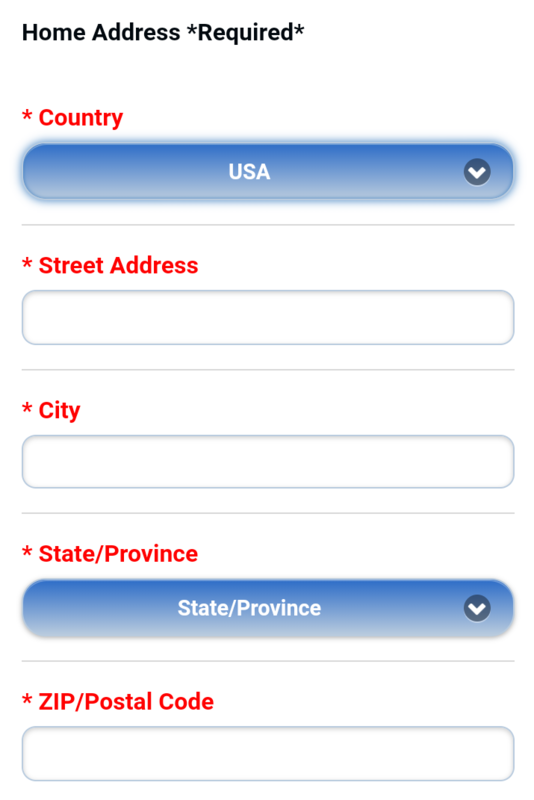 You can now choose your state, regardless of the country from which you are registering. This applies to desktop registration as well. 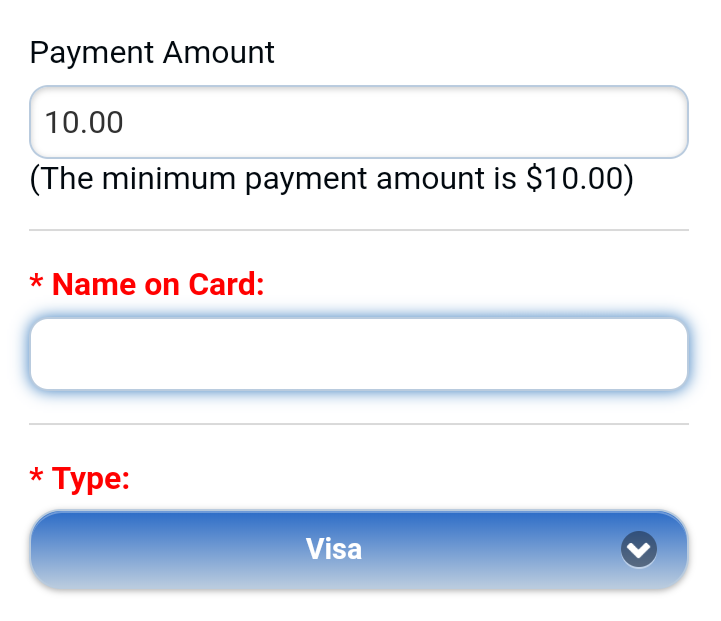 If you wish to pay by check or money order, you cannot register on a mobile device, which requires a minimum credit-card down payment of $10.00. Please contact the Wilmette institute to let us know that you intend to send a check or money order. The Institute will register you, using the information you provide by email. First, tap on the course title from any Wilmette Institute web page. This will take you to the Event Summary page (see screenshot below). ⇐ The Register button is at the top left of the summary page. 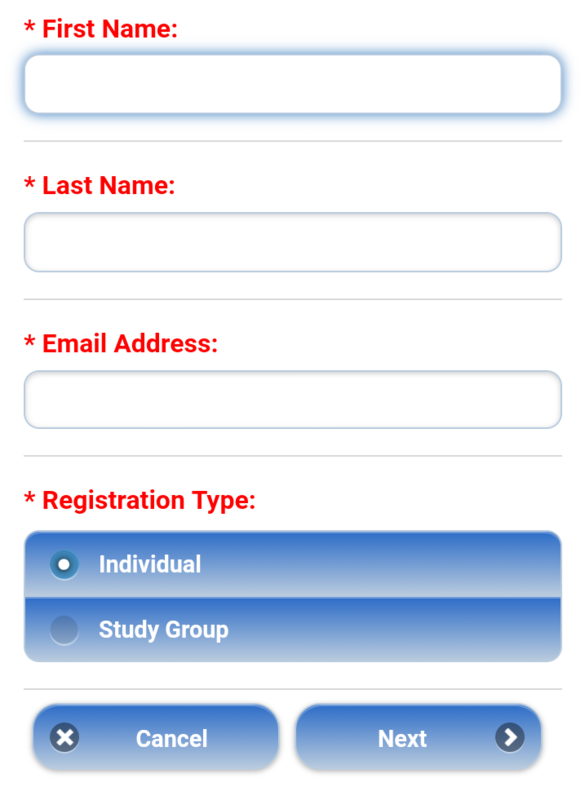 Or you can tap on the Menu button (top right) to see other options, such as the course schedule and course fees. Below (right) is what the first registration screen looks like. Enter your first and last names exactly the way you want them to appear in the course. If you use a middle name, add it in the First Name field. Put suffixes, such as “Jr.,” in the Last Name field. After you double-check the accuracy of your name, select the option button at the bottom for Individual registration. Then tap the Next button. 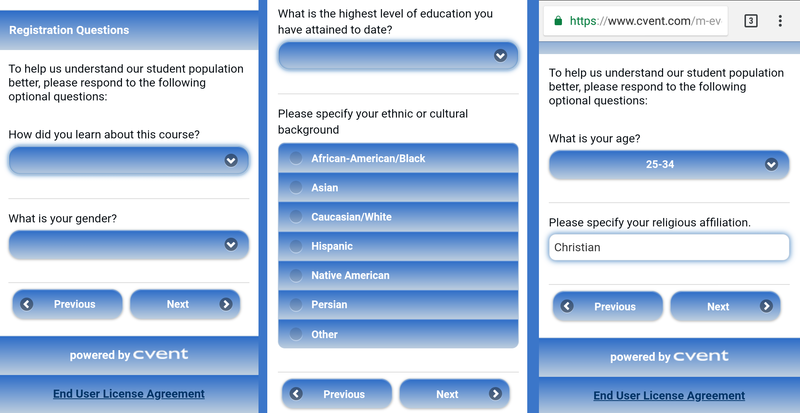 After inputting your home address, you will be asked a number of demographic questions that will help the Wilmette Institute learn about its student population. These questions are optional, but the Wilmette Institute hopes you will complete the information. 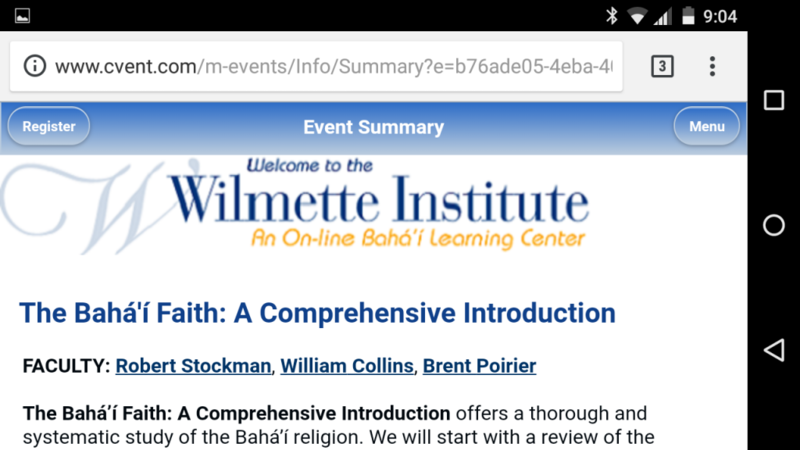 Note: You do not need to be a Bahá’í to participate in Wilmette Institute courses. Your age range is an especially important piece of information because, if you are 65 or older (or a student in college or university), you will be eligible for a 10 percent discount. Registering early (4 weeks before course starts) will secure a 10% discount, even if you only pay the minimum $10.00. The Wilmette Institute does not accept PayPal, but it honors most major credit cards. How to pay by check: Because self-registration requires a credit-card down payment (minimum $10.00) you will need to contact the Institute to let it know you intend to send a check. The Institute will register you, using the information you provide by email. If you receive your credit-card bills at an address different from your home address, now is the time to enter the different address. When you choose your country at the top of this screen, you will be able to choose your state from the menu at the bottom rather than having to enter it manually. You should receive your registration confirmation email within a few minutes of registering. The email will also contain instructions on how to log in to your course.